Most of the configuration options it provides can’t be tweaked using the taskbar properties or the registry. 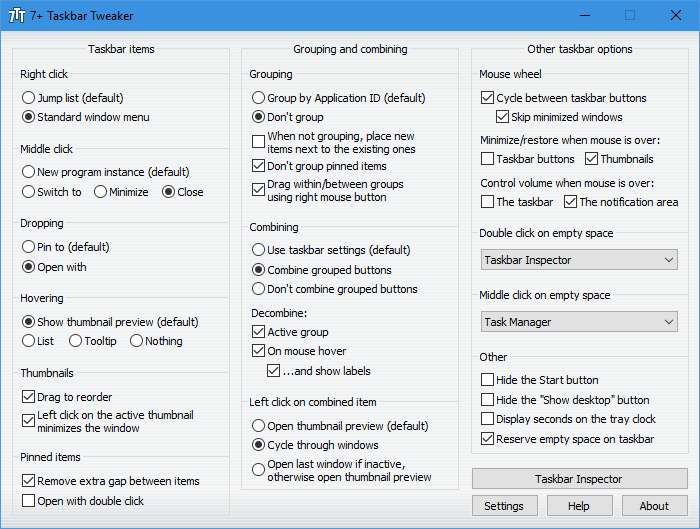 The tweaker is designed for Windows 7, Windows 8, Windows 8.1, and Windows 10. More info about beta versions. 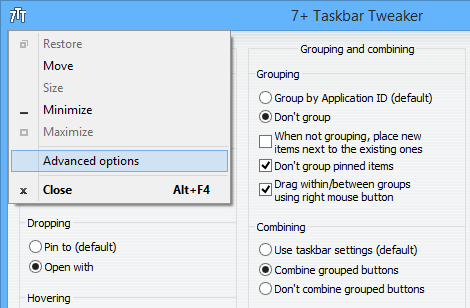 Q: Which registry keys does 7+ Taskbar Tweaker modify? I don’t need extra processes in my system. A: The only registry keys the tweaker modifies are its own settings. There are no registry keys for the options it provides. The tweaker does that by injecting a DLL to explorer, hooking/subclassing/some other methods of the dark side. As for extra processes, the tweaker is a native program, and is very lightweight. It shouldn’t slow down your system, and uses an extremely small amount of memory. Also, you can hide the tray icon if you want. P.S. if you’re a programmer, you might want to take a look at the 7+ Taskbar Tweaking Library. Q: My antivirus complains about 7+ Taskbar Tweaker. A: It’s a false positive. I guarantee that the tweaker binaries (and any other files on this site, unless specifically noted) are 100% clean. Also remember that the tweaker injects into explorer and modifies its memory, which is indeed suspicious. Q: Can I Group/Combine/Label only some of the items on the taskbar? A: Yes, use Taskbar Inspector. 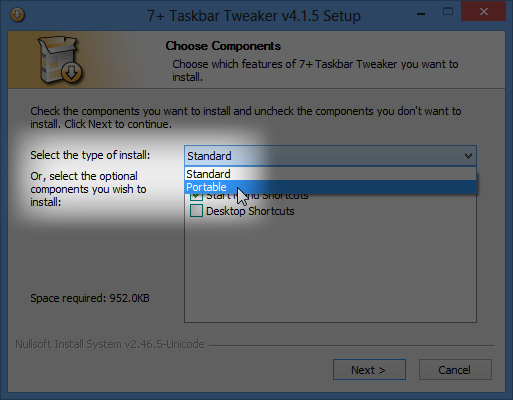 Q: Can I use 7+ Taskbar Tweaker in a commercial environment? A: Yes, feel free to use it wherever you want. Q: Where is the portable version? A: When installing the tweaker, choose the Portable type of install, as shown on the image below. The portable version will be extracted to the selected folder. Note: If the tweaker is already installed on your computer, the option won’t be visible. You can launch the setup with the /portable command line switch to force a portable installation. Q: I want to report a bug/suggest a feature! What is the best way to do it? A: Post it on the UserEcho page. Q: I want to translate 7+ Taskbar Tweaker to my language. A: The archive below contains the files needed to be translated. Please read readme.txt before proceeding. If you are brave enough to translate the help file, contact me for the required software and files. Posted in Releases, Software by RaMMicHaeL at September 30th, 2009. I was SO relieved to see that this worked on W8 too after having to upgrade from W7. Definitely crucial for my well being. That’s kinda sad actually… But nevertheless true. Well, the name is 7+ Taskbar Tweaker, so it’s 7TT on all platforms. Earlier, the program was simply called 7 Taskbar Tweaker, and I decided to rename it to 7+ Taskbar Tweaker to keep the abbreviation. Hey! Very nice add-on to Win7! If you ever consider adding more features, one that I’d like to see is something that would keep groups from splitting between multiple taskbar lines. Thanks for your prompt reply. Might have a talk with Binary Fortress and see if they can organise it. I have an idea for a new productivity feature. I do *not* maintain pop-up menus for many pinned applications which can show Pinned and Recent items. For these apps I suggest adding to each an On/Off switch which will keep them “narrow” on the Taskbar, along with pinned apps which do not support context menus. The ability to keep pinned app icons narrow on the Taskbar reduces wasted Taskbar space. There is a “Remove extra gap between items” under “Pinned Items” section. and then clicked on that folder in Quick Launch toolbar it will open that folder in a window, however if you click on it while holding CTRL it will show content of that folder in a dropdown popup. Just noticed (in Windows 8) that 7+ Taskbar Tweaker by default is installed into the current user’s profile. Though it works it seems very strange to me. What is the reason of such a decision? While installation I’ve changed the destination path to “C:\Program Files (x86)\7+ Taskbar Tweaker” and it works well as I can see by now. Anyway thanks a lot for the great work you have done! Installing to the Program Files folder requires administrator rights, while the AppData folder is writable by a non-admin user. I would like to be able to hide/unhide tray icons using [middleclik]. Would it be possible to implement a feature? 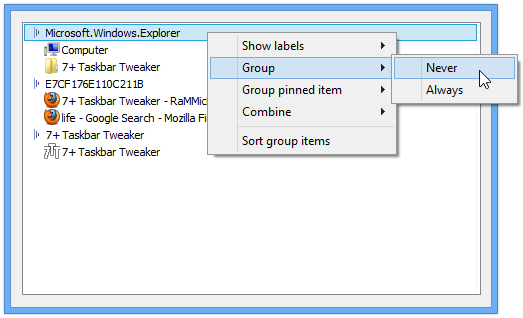 To add tabbed browsing to Windows 8.1 File Explorer on a system that is already using 7+ Taskbar Tweaker, is there a preference among QTTabBars, WindowTabs, Clover 3, XYplorer etc.? I’d like to have tabbed file browsing, and of course want to avoid conflicts and performance problems. Perhaps there is no problem in combining such software with 7+ Taskbar Tweaker, but felt it would be best first to ask whether readers here have relevant experiences and recommendations. I use QTTabBars and I’m very satisfied. I’ve tried Clover 3, but it felt buggy. I tried WindowTabs long ago, too, and didn’t like it, but perhaps it was improved since. I didn’t try XYplorer, but it’s not just an enhancement for Windows explorer, but a whole new file manager. Thank you very much for sharing your experience with those products. I’ve made a similar inquiry on the Classic Explorer forum, and if users there are also OK with QTTabBars then that’s the product which I’ll try. – Automatic alphabetic sorting of thumbnail/list preview. I see it can manually be done in Taskbar Inspector, but that’s not very practical. I think Explorer is what most would desire this feature for, so I think that’s most important. If this is difficult, I think an option to assign the default left-click on 7+TaskbarTweaker for sorting this manually would be a workaround that is at least useful. As it would take it from 4 clicks down to 1.
tray-icon left click, is what I meant to write. This is an old reply, but in came up when I was googling for the answer of the same question. In case someone else is looking for a shortcut to sort programs that are grouped on the task bar alphabetically automatically I wanted to leave a comment. Then, you can click on a group on the taskbar, hold, drag towards the desktop then release. The next time you click on the group, it will be alphabetized. In fact, you can bind it to any mouse combination, such as Ctrl+Right click in the example here. I have been using this product for the past 2 months, then updated my computer, so I am reinstalling it. One minor issue – the double click function no longer works for pinned items (single click only). Very minor, like I said, but have you ever encountered this before ? As for the double click issue – I haven’t encountered it, no. Please provide more details so I could try and reproduce it, such as Windows version, tweaker options, and taskbar properties. Wow, that was fast. Sorry, I’m a computer dunce, and am working in a foreign country’s language to boot (so my computer is not “in English”). So apparently I have Windows 7 Professional K.
And then nothing else is clicked (double/middle click on empty space is at “Nothing (default)”. Lastly, my taskbar properties: when I first got my new computer, there were 4 sections: start; open applications, “something else”; and notifications. The “something else” had some strange green/black globe, with various options like ‘switch to chinese’ and other things I have never used and which I didn’t like, so after much effort, I was eventually able to delete it (not sure what it was – it would not go away easily). I then added the quick launch section, so now back to 4 sections. I hope that’s descriptive enough – do you have any idea what that “something else” section was ? I will have to confirm with our IT guys, I guess. As an aside, now that I think about it, I thought clicking “When not grouping, place new items next to the existing ones”, would open every new choice in order (so it could be a Doc file, then e-mail, then Doc file again, then Internet window – in other words, everything in order that I have opened them). But this choice actually makes all doc files together, and all e-mail files together, etc. Is this not also an error ? Sorry, but I don’t have a chance to check it on a Windows 7 computer at the moment. * Turn off all options but this. Does the issue occur even when all other options of the tweaker are turned off? No. That’s what should happen if you just disable grouping. Please see the help file, perhaps it will clarify things for you. I tried turning off all “check” marks, but no difference. I also downloaded the previous version that is 3 months old (which is the version I would have installed previously). Regarding taskbar properties, I think I provided a description immediately below. Lastly, when I click twice, the program opens twice. I suppose this may be something wrong on my side – I have different virus protection programs, so that may be the culprit. Thanks for your time and effort, in any event – very much appreciated !! I just looked up some more things, and I think that “something else” was just a desk band or tool band or something, and deleting the same has no real consequence. I will confirm, but right now I am pretty sure that was it. Of the first 3 boxes (lock, automatic hiding, small icons) only small icons is clicked. The Aero Peek box is greyed out. Of the next 2 boxes, I clicked the 2nd one only (I think it says “Recently used files are saved and show the start menu and the taskbar”). Only Quick Launch is checked. Well, that’s all I can say for now. Sorry for all the hassle for just a minor point. Ugh, sorry to bother you so much, but one more thing – I saw this discussion where the pop-up blocker was an issue. I am not sure of my pop-up blocker status, but will check tomorrow after asking my IT guys. Let me clarify – what happens when you turn on the “Open with double click” option? * Does it stop working at all? i.e. items just don’t open? * Or do they open with a single click too, so this option doesn’t have any effect for you? Hi, I just installed the latest stable version today (4.5.2) and whenever I use the scroll wheel to cycle between the taskbar buttons now, explorer crashes and restarts. This problem wasn’t present in the previous version. Should be fixed in v4.5.3. Just updated to 4.5.3, no problems so far with my current settings. Ok I know this is too early, but I tried to run this on Windows 10 Preview and I get a messagebox that says it’s only for win7/8. Do you reckon it would work if you disable the windows check inside 7+ TT? Or it will probably won’t work? It won’t work, porting will require some work. The latest build of Taskbar Tweaker 4.5.2 is crashing Windows Explorer whenever I use the mouse wheel to maximize/minimize windows. How do I get the previous version installed again? Found the previous version 4.5.1 at FreewareFiles.com using the copy archived at that site. Explorer is no longer crashing. I just updated to 4.5.2, and I’m having a bit of an issue. I have it set so that the mouse wheel will cycle between taskbar buttons, but whenever I scroll, Windows Explorer crashes. I’m running Windows 7 Home Premium SP1 x64. Since 4.5.2 the option to group by apllication ID bot don’t combine grouped buttons doesn’t work anymore. 4.5.3 also doesn’t work. Is the issue about grouping or about combining? It would be best if you could provide a screenshot of the issue, and of your tweaker options and taskbar properties. Also, is this your report about the same issue? I will post a screenshot later. Btw. Thanks for this great software. I’ve never had any bugs or problems until now. I like your work. Thanks for update. For some reason automatic update was failed: inject.dll wasn’t updated and in result 7TT can’t start. I’ve restarted my Windows and reinstalled 7TT, and problem was solved. Could it be caused by an antivirus? Users complained about this issue in the past, but unfortunately I can’t do much with it as the issue looks random. If you manage to find a way to reproduce it, please tell me. Does not work on Windows 10. Help me please! Since updating to 4.5.3, when I single click on anything on the taskbar, explorer quits and restarts. I’ll try removing and adding again and failing that will try to source an older version. FYI: still happens after an un-install and re-install on Windows 8.1 (haven’t tested anywhere else) but have confirmed it’s related to the ‘advanced options’, ‘Mouse button control’, ‘taskbaritem|click’=’1’ setting. If I remove that it works fine. I rely on that to stop it minimizing windows if I accidentally click on the wrong one. Please try the latest beta. Does it fix the issue? Working a treat in 4.5.4, thanks for the quick fix! So, as I fully expected, 7+ Taskbar Tweaker does not work on the Windows 10 Technical Preview. Well, actually, I don’t know if it works because the tweaker pops up a dialogue with the message, “This tweaker is designed for Windows 7/8 only”, and then exits. I expect it’ll be a while before it is modified to work with Windows 10. Just putting this out there in case anybody was wondering. I’m happy to donate some cash if that’ll help Win 10 support happen. After upgrading to 7.5.3 from 7.5.1 the “don’t group” or “don’t combine” option don’t work anymore. All applications are grouped now, no matter what I do. I’ve tried to kill and re-launch 7TT, but haven’t tried to reboot the PC yet. Windows 8.1 here, with almost all latest updates. Oh, sorry. It was already reported. Tried v4.5.3.1 beta – “don’t combine” works correctly now. Добавьте, пожалуйста, кнопку “дополнительные параметры” в главное окно. Неудобно каждый раз включать отображение иконки в трее только для того, чтобы из ее контекстного меню попасть в доп.параметры. Спасибо. “Расширенные параметры” можно найти в контекстном меню главного окна. Thank GOD someone was smart enough to kill that thumbnail popups on Task Bar I was ready to format my new computer and completely remove Windows 8 just because of this annoyance. How could anybody at MS be so stupid, what is the purpose of this feature anyways, I hope MS seeks out the employee that created this popup window hover thing on the task bar and FIRES them, everybody knows people HATE POPUP windows especially those that have no practical use, I can see what windows I have open on my task bar I dont need some popup you CANT READ nagging me. MS also needs to fire those responsible for not providing a means to turn off this annoyance if you search the web its been a problem for a long time. MS needs to hire you to solve many of their annoyances or fire those that are creating all these stupid annoyances. Thanks so much you prevented me from formatting my new PC and installing a Linux build this and “Classic Start Menu” will be the first programs installed on my Win 8 machines in the future. Your newest version of taskbar tweaker is FLAWED. It fails to disable the taskbar previews on windows 7. 100% failure rate. Does not do it when I tell it to. · With v4.5.4.1, it sometimes is necessary to press the Windows key three times to get the taskbar to appear. That behavior occurs regardless of whether that function’s Data value is set to 1 or 2. While that “press three times” behavior is not desirable, it nevertheless is preferable to having the taskbar pop-out when it is not wanted! Thanks for your continuing efforts to perfect the “disable_topmost” function. An easy workaround for the “press three times” behavior noted in my post above is to use “Windows Key + B” to display the taskbar (instead of just “Windows Key”). Another easy workaround for the “press three times” behavior noted in my post above is to use “Windows Key + T” to display the taskbar (instead of just “Windows Key”). However, a disadvantage of that workaround is that it always displays a thumbnail for the first application button on the taskbar — even if 7+TT “Hovering” is set to “Tooltip” (my preference). What do you mean by “to get the taskbar to appear”? Is it configured to auto-hide? Yes, taskbar auto-hide is enabled. · press 3 on the Windows key displays the taskbar and Classic Start Menu simultaneously. · press 6 does the same as press 2 … etc. In other words, press 3 produces the same behavior as press 1 did with previous versions of 7+TT. and the taskbar (and Classic Start Menu) never display — making DISabling auto-hide a non-viable option on my system. My workaround is to use “Windows Key + B” to display the taskbar. One difference when using that workaround (and with auto-hide ENabled) is that Classic Start Menu does not display until the mouse pointer is hovered over the Windows Start button. That’s not a problem — it’s just something new to get used to. In case it might be relevant, I should add to my above posts that I configure the Windows 8.1 taskbar as “Left.” I widen it to the width of eight Large toolbar icons, and then add to the taskbar various rows of custom toolbars. That’s the way I have used the Windows taskbar since Windows 2000. Hmm, perhaps Classic Start Menu is involved here. Have you tried it with Classic Start Menu disabled? · pressing “Windows Key + T” or “Windows Key + B” displays the (now-transparent) taskbar. Is that test a valid response to your question? As a follow-up to my previous, post if I then re-execute Classic Start Menu (via the Modern UI), pressing the Windows key displays the (now-opaque) taskbar and the Classic Start Menu simultaneously — in the same way that the Windows key worked with versions of 7+TT before 4.5.4.1 and 4.5.4.2. However, if I then reboot the computer, the problematic behavior described above returns and I’m back to using “Windows + B” for easy access to the taskbar. My computer has multiple users, and not all of them have been able to master the new habit of a “Windows key + B” workaround for display of the taskbar with 7+TT betas 4.5.4.1 and 4.5.4.2. As a temporary solution, I’ve reverted the computer to 7+TT versions 4.5.1.7 beta, which offers normal “Windows key” display of the taskbar. However, with 4.5.1.7 the “disable_topmost” function is not as reliable as it with with 4.5.4.1 and 4.5.4.2 — so, as with many workarounds, it’s a tradeoff! I’ve played with it on Windows 8 with Classic Start Menu, and it worked for me most of the time. I moved the taskbar to the left, set it to auto-hide, and configured “disable_topmost” to 2. Then I run Notepad, maximized it, and pressed the Windows key a couple of times. Except one time when the taskbar randomly didn’t show up, it worked as expected. If you have a good way to reproduce the issue, I’ll try it. Also, I think that it might be easier for the Classic Start Menu author to fix it at this point. Thanks for your efforts on that issue. My reproducing of the issue is detailed above. There must be some relevant hardware or software difference between my computer and yours. As we both use Classic Menu, that program is not likely to be the issue — correct? My taskbar is now on the right side of the left monitor, which places it “between” monitors instead of on the far left of the monitors, and which makes it more difficult to trigger the taskbar inadvertently. That change, plus reverting 4.5.1.7 beta, combine to produce a stable result that all the users of the computer find workable. As far as I know, there is no method at present for 7+TT users to receive notice of new beta builds — correct? Would it be a good idea for 7+TT’s “Settings” to offer “Check for betas” in addition to “Check for updates”? At present, I learn about new beta builds only via postings that happen to mention them. Hi can you please add windows 10 support. It is possible that if you remove the os check it will run on windows 10 as it is very similar to windows 8. Even if there are some bits that do not work at least majority of the functionality may work in windows 10 and that may be sufficient enough to remove the OS check for windows 10 compatibility. thanks for great application. 7TT has started misbehaving – I have always had it setup to group items with the task bar icon. 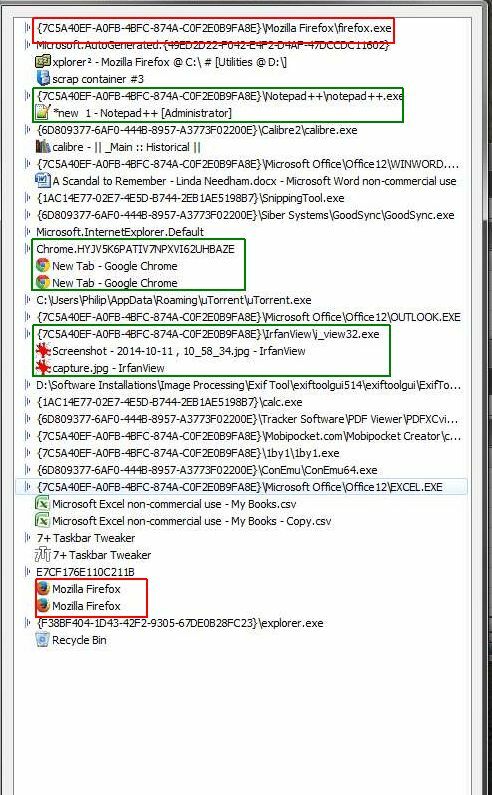 My commonly used programs are pinned to the TB, which are the icons except the last two in this screen shot ==>> http://i.imgbox.com/6P0r57kz.jpg. As you can see X2, NP++ & Chrome icons have multiple windows open, Word and calibre (books) have one. But the active windows for Firefox and Goodsynch (the red & white ball) are detached from their pinned icons. I inadvertently unpinned the Firefox icon, when I repinned it I got this behaviour, I’m not sure when Goodsynch started to misbehave. I don’t care so much about Goodsynch, but I really care about Firefox at I habitually go in/out of it with Win/1. I pinned Excel to the taskbar and its behaving as I like – window icons are grouped on the pinned icon. From the screenshot of Taskbar Inspector you can see that the AppIDs of the pinned Firefox and of the running Firefox are different. Just unpin the pinned item, and pin it again by right clicking the running Firefox instance and choosing “Pin this program to taskbar”. As for GoodSync, you didn’t include it in the screenshot, so I cannot say whether it’s the same issue. Another issue might be that you chose to not group the pinned items of GoodSync. You can check this by right clicking the AppID of GoodSync in Taskbar Inspector. Thank you – that worked fine, worked for Goodsynch too. I’ve always pinned the .exe, which has ‘always’ given me the desired behaviour – as it did for Excel yesterday. Oh, I think i worked out why I got that apparently spurious Update Notify, in trying to solve my problem I reinstalled 4.5.2. I just got a new version notify that said it would fix the combine problem. But it was 4.5.4 which I’m currently using! I’ve been using 7TT for several months on Windows 7 Home Office (64bit), and it displays the thumbnails on hover. I now have a new computer with Windows 7 Professional (64bit), and thumbnails aren’t displayed on hover, despite that option being checked. Instead the list is always displayed. Do you have any idea as to what might be going on? Taskbar thumbnail previews only work if you are using an Aero Theme. Also, the feature is not available in basic Windows editions, such as Windows 7 Starter edition. I’m using Windows 10 preview, and i’m trying to change the width of the task bar buttons after setting the “Never combine” option, but changing the “MinWidth” value in the registry doesnt help. Unfortunately, Windows 10 is not yet supported by the tweaker. Is it possible applications send it to the system tray? Sometimes I want to hide applications. Thanks much. Have a nice day. 7+ Taskbar Tweaker doesn’t have this feature, and I don’t plan to add it. I believe that there are several apps around which provide the kind of feature, though. Simply googling for “minimize to tray” reveals some of them. I can recommend HotkeyP. HotkeyP supports both Hide and Minimize to tray features. 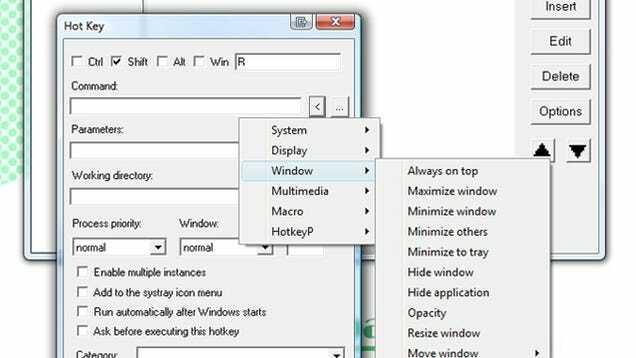 Note that although HotkeyP supports mouse & keys combinations, it does not support actions by clicking taskbar buttons like 7+ Taskbar Tweaker (Advanced Options). Hope that double clicking on taskbar to pop up “Uninstall Programs”. Mouse Button Control: options to close all items of a button group. I knew that it will be a high-frequency feature for me. Thank You for this lovely feature and a terrific app. I am using windows 7. I have been using taskbar tweaker for a long time and have loved it. I am now using version 4.5.4 However, it does not seem to be working. I cannot drag the thumbnails. I have selected the first 4 items as default and have ticked the box to drag to reorder thumbnails. I have also tried many other combinations of other these and other settings to no avail. i have even added it to my security software to be excluded. From the information you’ve provided, I cannot say what the issue is. * Is the “drag to reorder thumbnails” option the only one which doesn’t work? Do other options work? * Did it work before? If it did, can you say what caused it to stop working? * Do you see any error message when launching the tweaker? Now, nothing works. It used to work, then, only right click and drag worked. That lasted for a bit. Now, i cannot drag my icons at all. i do not get any error messages when it launches at startup. Under “Other” the first three seem to work. So you’re saying that all options work, except for dragging thumbnails and dragging with the right mouse button? Sorry, but I can’t think of a reason for the issue. Thank You The Application Has Been Very Help For Ungrouping Taskbar Items. Very useful software that should have been a in Windows control panel. I used the program to restore “classic” behavior of the Win2000 task bar. I am pleased with the relatively light memory usage of around 900K. On my system, I renamed the program “ztaskbar.exe” in lowercase letters, which is what I believe a TSR should look like, so as not to stick out like a sore thumb in task manager. Does the improved “disable_topmost” option of v4.5.5 differ from the “disable_topmost” option of v4.5.4.1 beta? Sorry, but I don’t speak French. “7+ Taskbar Tweaker: Could not load library (102)”. I downloaded “7+ Taskbar Tweaking Library” as well, but not sure where to put it… anyone else experience this? You don’t need the 7+ Taskbar Tweaking Library in order to use the tweaker. v4.5.5 has a bug which I discovered recently, which could lead to a crash. This should be fixed in the latest beta version, please try it.